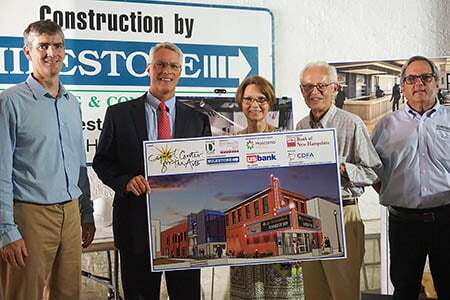 The former Concord Theatre undergoing renovation in downtown Concord will known as the Bank of New Hampshire Stage|! !| in recognition of a significant financial contribution by the financial institution. Announcing the renaming at an Aug. 29 press conference were|! !| from left: Kreg Jones|! !| The Architects; Paul J. Falvey|! !| CEO|! !| Bank of New Hampshire; Nicolette Clark|! !| executive director|! !| Capitol Center for the Arts; Dr. Robert Wilson|! !| Capitol Center campaign chair; and Mark Goldstein|! !| principal and project manager|! !| Milestone Engineering & Construction Inc.
Real estate data analytics firm CoreLogic reports that home prices in New Hampshire rose 5.2 percent year-over-year in July. Nationally, the company said, home prices increased by 6.2 percent year over year. CoreLogic said it expects national home prices to increase by 5.1 percent on a year-over-year basis from July 2018 to July 2019. On the rental cost side, Apartment List says that rents in Manchester actually fell– by 0.4 percent – in August, although they have risen by 3.1 percent for the year. Manchester's median two-bedroom rent of $1,350 is above the national average of $1,180. The firm’s national rent index remained flat in August, leveling off after six straight monthly increases. Preliminary construction has begun on Weeks Medical Center’s new $13 million Lancaster Patient Care Center, adjacent to the hospital. The new facility will house primary care, outpatient specialty services and provide more accessible and private consultation space for patients and staff. A capital campaign to raise $4 million from the community will be announced at public events on Wednesday, Sept. 19. Bar Harbor Bank & Trust has begun renovating the interior of its office at 9 Main St. in Newport. Work began on Aug. 20, with an expected completion date of March 2019. A complete interior makeover of the branch lobby is planned. Local chosen for the project include: Jewett Construction(general contractor);A.S. Bartlett & Sons Inc.(electrician); Biron’s Flooring; Claremont Glassworks Inc.; Pinnacle Painting Inc.; Granite State Plumbing and Heating; andHampshire Fire Protection. Amherst-based Fulcrum Associatesrecently completed dorm renovations at Southern New Hampshire University to support the university’s recently launched varsity esports program. The gaming suite in Hampton Hall was renovated in preparation for gaming equipment upgrades. Interior renovations throughout the remainder of the building, and adjacent Windsor Hall dormitory, were also completed. They are the only pod-style residences on campus. The NH Liquor Commission has begun renovations on the Lancaster Liquor & Wine Outlet. NHLC, which will close the Lancaster store during renovations and plans to reopen the store in mid-October, will expand store space from 5,000 square feet to 6,500 square feet. The Center for Youth and Teen Leadership at the YMCA of Downtown Manchester will soon open as renovation of the 5,200-square-foot space nears completion. The center will have its own entrance off Stark Street and is equipped to serve up to 200 youth and teens ages 11 to 17. The program will include after-school open teen center hours, monthly teen nights, teen mentoring, homework help, health education, life-skills training, college and career preparation and a variety of educational and enrichment programs. Kenna DiPiro of Campton has joined Peabody & Smith Realty, working at the firm’s Plymouth office. The Duprey Companieswill be presenting the 12thannual Multicultural Festival, taking place from 11 a.m. to 4 p.m., Sunday, Sept. 23, at the State House in Concord. The Festival takes place on the final day of National Welcoming Week 2018, an annual series of events across the nation that bring together immigrants, refugees, and native-born residents to raise awareness of the benefits of welcoming everyone. The event is organized by We Are Concord (formerly the Greater Concord Area Task Force Against Racism & Intolerance), with further financial support from Lincoln Financial Group, Merrimack County Savings Bank, JLiv Inspirations, NH State Council on the Arts, NH Food Bank, DeeLuxe Bartending & Event Specialists, Granite United Way, Mulberry Creek Imagery, Putnam Marketing, Accompany Video Production and The Room Records. For more information, visit concordnhmulticulturalfestival.org. Prolman Realty Inc.has been selected to market for sale 52-54 Nashua Street in Milford. Lisa Ferrari and Mark Prolman represent the seller of the 10,000-square-foot historic building located within walking distance to the Milford Oval. Asking price is $625,000. U.S. Sens. Jeanne Shaheen and Maggie Hassanand U.S. Reps. Carol Shea-Porterand Annie Kusterhave announced that the U.S. Department of Housing and Urban Development has awarded $14,333,057 in grants for urban community development and affordable housing in New Hampshire. The grants include an $8,849,833 community development block grant, a $3,879,488 HOME grant, an $870,215 emergency solutions grant, and a $733,521 housing opportunities for persons with AIDS grant. They will be used to support efforts to expand affordable housing throughout New Hampshire, particularly for people experiencing a housing crisis or homelessness, and expand economic opportunities, principally for low- and moderate income individuals, the lawmakers said.